In windows, you can change settings that define when, if at all, you would like your computer to go into sleep mode, dim the display, turn off the display etc. 1. 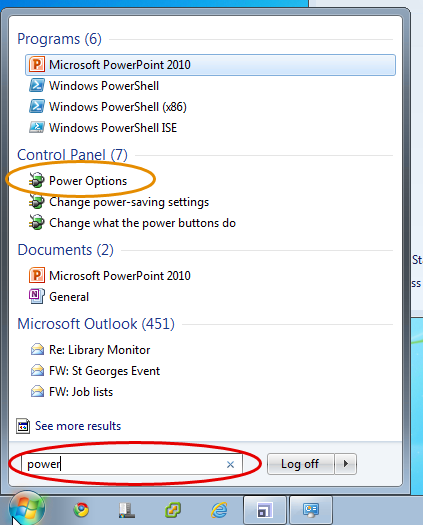 Click on the start menu in the bottom left hand corner, then in the search field type in ‘power’ (circled in red below). You will need to wait a few seconds for the search to run, then you should get some results similar to those shown below displayed in the start menu. Click on ‘Power Options’ (circled in orange below). 2. 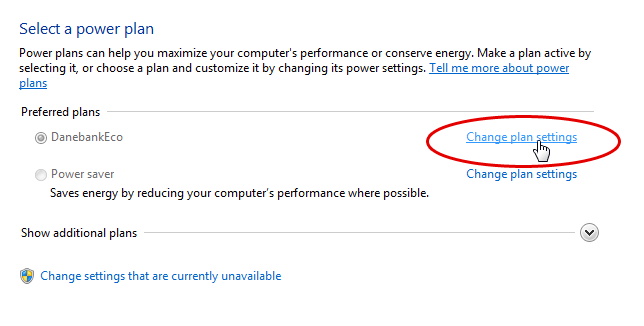 To change the amount of time before your computer goes to sleep or switches off it’s display, click on ‘Change plan settings’ (circled in red below). If you are on a laptop you may also have an option in the left column to change how the laptop behaves when you close the lid.